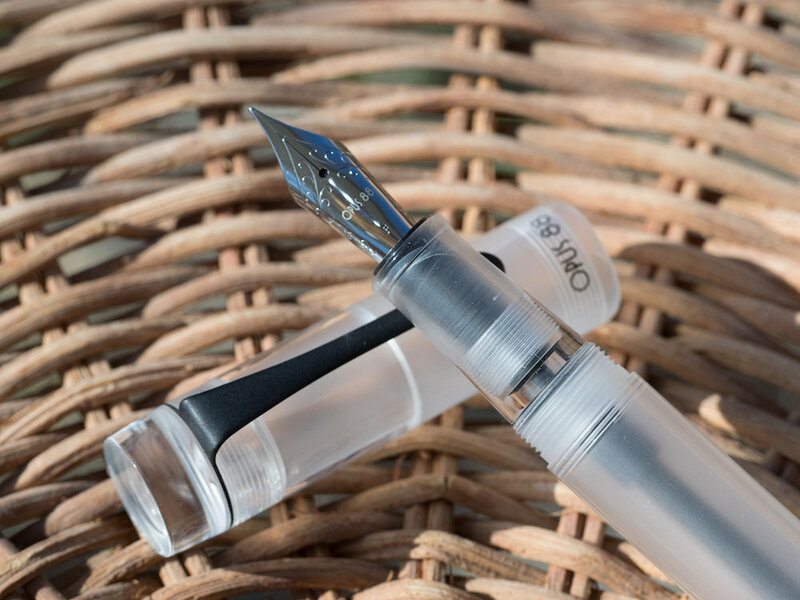 The Opus 88 Koloro Demonstrator is an over-sized fountain pen with an eyedropper filling system. It comes with a steel Jowo nib in fine or medium. The pen arrives in a nice box with a brown outer sleeve. The box itself is black and has a magnetic closure. When you open the box, the pen and eyedropper are nestled in foam cut-outs. Well . . . they are supposed to be nestled. My pen was rolling around when I opened it; fortunately, no harm was done. The pen is made of acrylic, but the cap and barrel have a frosted look that I really like. The clip is matte black, and it complements the frosted cap perfectly. The only branding is on the cap band which is inscribed with “Opus 88” in black. 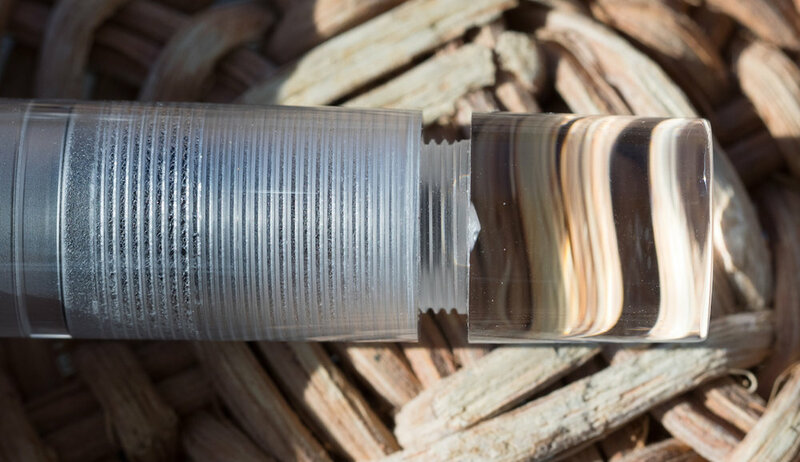 The finial on top and the piston knob are both thick, clear acrylic. The pen is filled with a glass eyedropper (which comes with the pen). Simply unscrew the grip from the barrel and fill it with the ink of your choice. 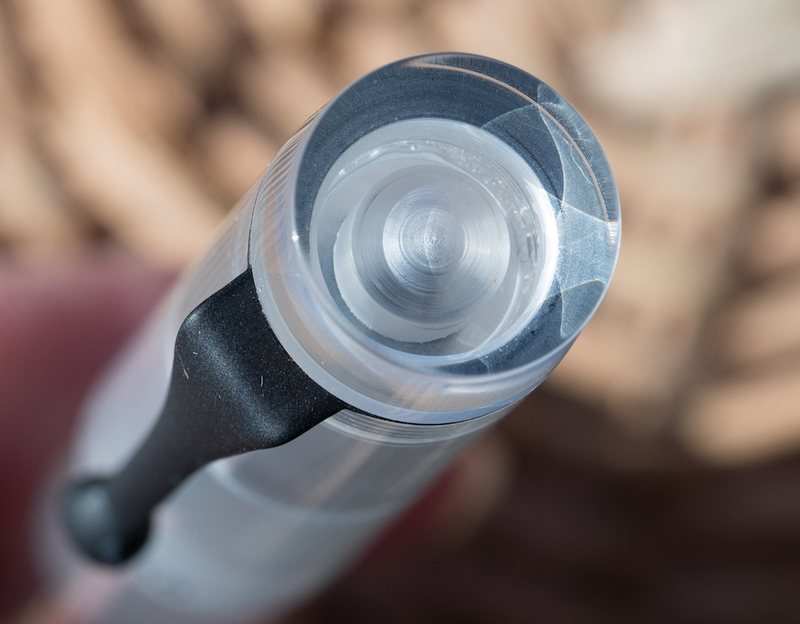 The grip section has a rubber ring that seals when you screw it back on to the barrel. No silicone grease is necessary. When you’re ready to write, you unscrew the piston knob a few turns to create flow. The barrel holds an enormous amount of ink (at least 2.0 ml), and since the barrel is transparent, you’ll always know when you’re getting low. 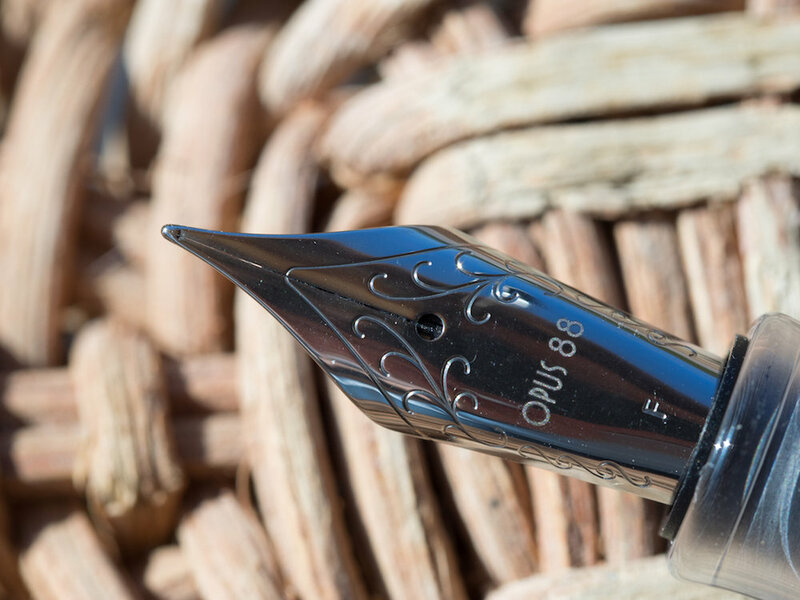 The #6 Jowo steel nib is decorated with some scrollwork and Opus 88 branding. My fine nib writes flawlessly—it is smooth and wet. I experienced no hard starts or scratchiness with this nib. As I said above, the Opus 88 is an over-sized pen. It measures a bit over 5.75 inches (146mm) in length capped and 5.39 inches (137mm) uncapped. It isn’t meant to be posted, and, really, it’s large enough that posting would throw off the balance anyway. Even though this is a large pen, it isn’t heavy. I find it to be perfectly balanced even with a barrel full of ink. I love how substantive it feels in the hand. This is a well-made pen. The Opus 88 Koloro Demonstrator reminds me (in some ways) of my Conid Minimalistica (review here), but the Opus is much easier to fill and clean, and it is much less expensive. I am very impressed with my Opus 88 Koloro Demonstrator. It looks fantastic, especially when it is filled with a beautiful ink color. The eyedropper system works well and the rubber ring keeps it from leaking. The nib is smooth and responsive. This is, simply put, an excellent pen. 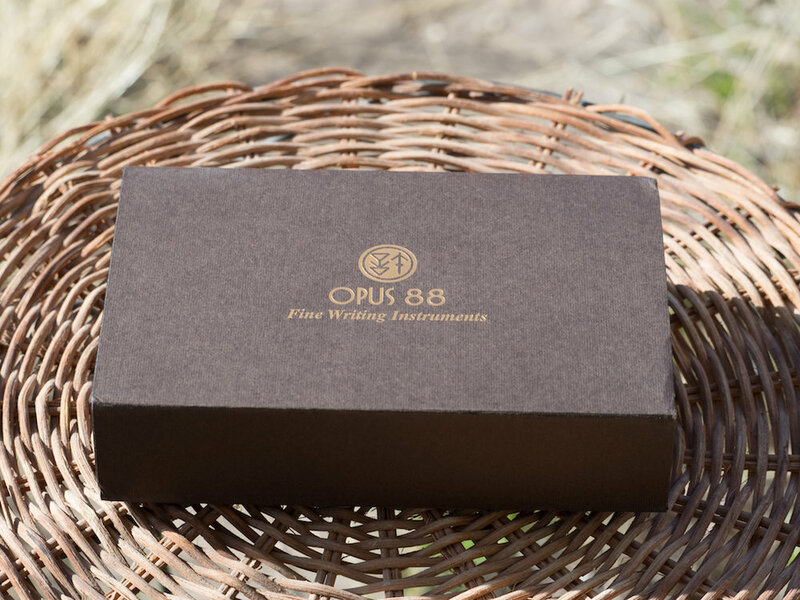 You can purchase the Opus 88 Koloro Demonstrator from Pen Chalet for $120.00. If you’ve ever wanted to try an eyedropper pen but have been put off by how expensive they can be, this is the perfect fountain pen for you. And, if you think the Opus 88 Koloro Demonstrator might be too big for your hand, you can try the smaller versions (also eyedroppers) that come in various colors and cost $93.00 at Pen Chalet. 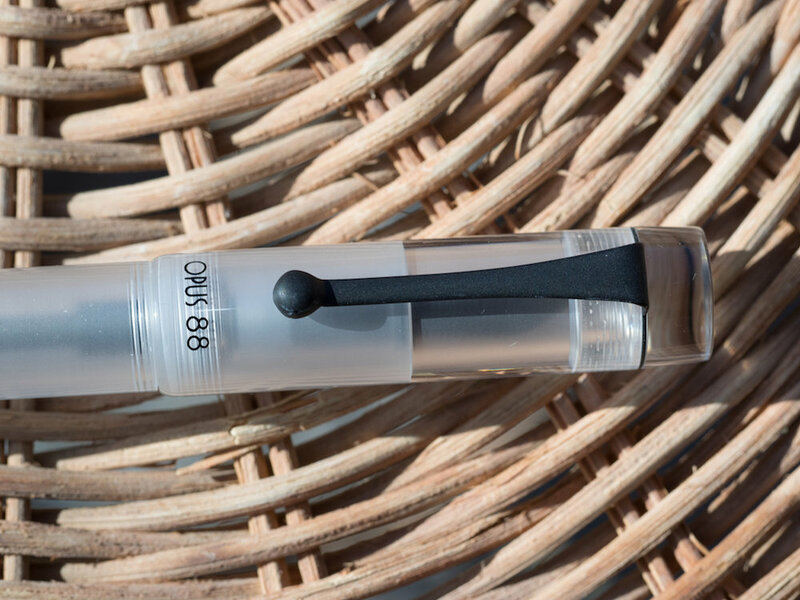 The Opus 88 Koloro demonstrator is a well-made pen that feels substantive in your hand. 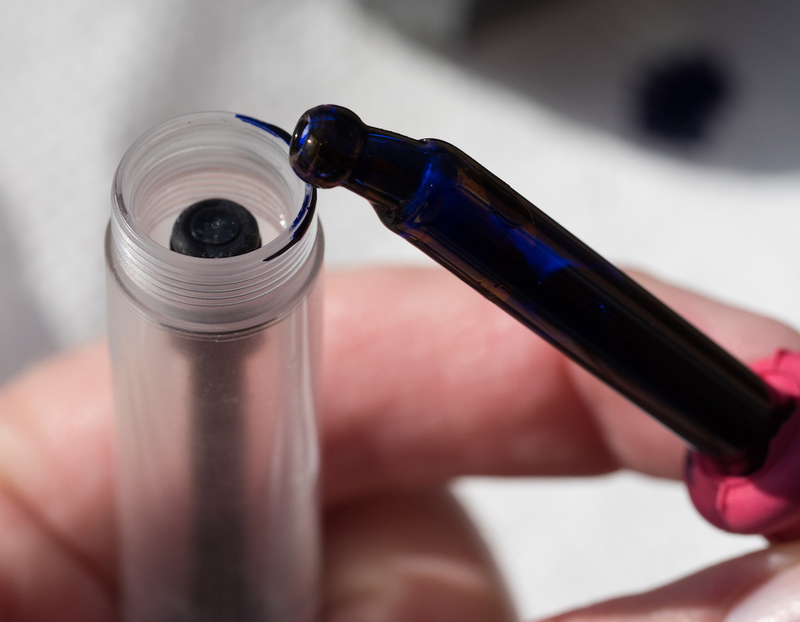 Because it is an over-sized pen with an eyedropper filling system, it holds a huge amount of ink. The Jowo nib on my Opus 88 writes flawlessly. I really like the look of this pen with the frosted barrel, cap, and matte black clip. Because it is a demonstrator, it will show off whatever ink you fill it with. This over-sized pen might be too big for some people, but smaller Opus 88s are available (though not in the clear demonstrator version). One thing you have to remember with this pen is to unscrew the piston knob before you start writing. I don’t find this bothersome at all, but it is an extra step. Posted on March 23, 2018 by Susan Pigott and filed under Opus, Fountain Pens, Pen Reviews.